How to Reach: The nearest airport is at the capital city Jaipur and the nearest railway station is at Ajmer. From here, Pushkar can be reached in a bus as it is well connected by roads. Located in the state of Rajasthan in India, Pushkar pilgrimage site is one of the holiest in India. This small town has around 500 temples and is considered to be very sacred by the Hindus. The town of Pushkar is also called as "City of Temples". One of the most important Hindu temples in Pushkar is the Brahma Temple, which is one of its kinds in India. The small quiet town springs to life and buzzing activity every year during the famous Camel Fair that is held in Pushkar usually in the month of October. To know more about Pushkar temples, read further. 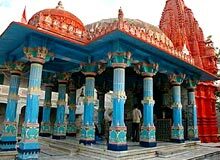 Brahma Temple located in Pushkar is the only temple in India that is devoted to the creator of the universe, Lord Brahma. It is said that Lord Brahma had performed a religious ritual over here along with other Gods and hence is considered to be a very sacred place. It is said that the beautiful lake at Pushkar was created miraculously when a lotus fell down from the hands of Lord Brahma and fell at Pushkar. This temple is dedicated to Goddess Savitri, the wife of Lord Brahma. The temple is located at the top of a hillock and the views of the surrounding landscape from here are said to be splendid. The temple can be reached by a long series of stairs. A very famous temple in Pushkar, this temple is dedicated to the third incarnation of Lord Vishnu, which was in the form of a boar. It is said that Lord Vishnu as Waraha killed the demon Hiranyaksha, recovered a stolen Veda and saved the earth from drowning in the ocean. The Rangji Temple of Pushkar is unique because of its architectural style. It is constructed in the Dravidian style with a typical "Gopuram" (main temple dome) rising at the top. One can also see some influences of Rajput style of architecture. The temple was constructed in the year 1823 by Seth Puranmal Ganeriwal of Hyderabad.